Photo: John Kenyon/Offshore Public Relations Cut line - Powerboat P1 wrote one for the offshore history books as the SuperStock USA Championship launched its 2018 series at Miami Marine Stadium. This one is a story as much about reminiscing as it is about racing: here’s why. “The events will bring great nostalgia to those that remember how racing was… bring excitement to those experiencing the stadium’s magic for the first time,” Powerboat P1 CEO, Azam Rangoonwala said. And that’s exactly how it went! The return of powerboat racing to Miami Marine Stadium welcomed rookie and veteran fans as the P1 SuperStock fleet took the green flag following a 26-year hiatus at this iconic venue. Located on Virginia Key, the historic Miami site boasts an impressive resume: the first stadium purpose-built for powerboat racing in the country. Back in the day, the 6,566 seat stadium hosted a myriad of mega powerboat events including Unlimited Hydroplane, Inboard, Outboard and Grand National categories until its final major race (and the first time I ever saw the Unlimiteds run): the 20th Annual Budweiser Hydroplane Regatta in June 1990. Patrol boat volunteer, John Kenyon, whose 20′ Sea Craft is in the background, provided this famous back-in-the-day photograph by Jimmy Jost. Regrettably, the watersports haven was declared unsafe, shuttered in 1992 following Hurricane Andrew and until last weekend, powerboat racing was a thing of the past. 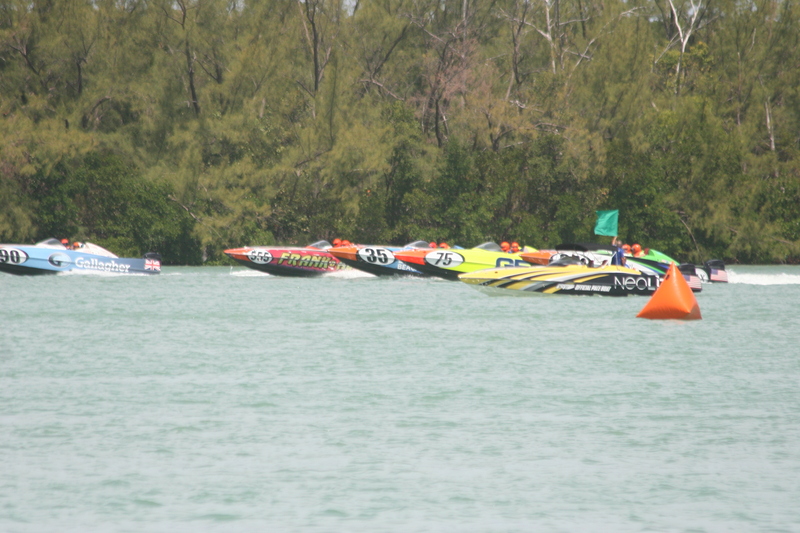 Although Mother Nature created a mix of challenges including inclement weather, it was game on as “the SuperStock powerboats had to wait til Sunday to race, due to local marine life appearing including, dolphins, manatees and sea turtles,” Azam Rangoonwala explained. Entering its eighth season, the 2018 series unleashes a new Panther sporting a re-design by Wilson Custom Composites and 300XS Mercury Racing power package that has upped the speed of the 29’ vee hull to 75 mph: clearly evident once the racing action started. At the start, Geico grabbed the lead of the 8 lap race, followed by Visit Jacksonville and 2017 Champions Frank & Al’s Pizza. Early deck-to-deck racing ensued along the 1.6-mile course between Geico and Frank & Al’s Pizza as the teams vied for the lead; however, by Lap 2, Frank & Al’s Pizza made their move, gained a sizeable lead and never looked back. Driver Frank Silva and navigator Chris Mejias captured the checkered flag and continued their winning ways as the pair piloted Frank & Al’s Pizza across the finish line. Their early-in-the-race positions remained for Brian Maine and Tony Knight aboard Geico Racing as the team took second, while George Ivey and Brian Lynch in Visit Jacksonville rounded out the podium. Bobbye Miller Kenyon is an award-winning journalist whose high-performance articles appeared in Hot Boat Magazine, along with fast-paced marine industry news in her Hot Sheet Column, from 1997-2008 and Powerboat Magazine from 2009-2012. She received a special award from the State of Kentucky in 2014 as she was commissioned a Kentucky Colonel by Governor Steven L. Beshear for her writing efforts that showcased the diverse boating locales throughout the Bluegrass State. Her company, Offshore Public Relations, is a multi-faceted firm that has represented marine industry leaders and champions in the offshore racing arena. A native Miamian, she enjoys boating off the Florida Keys waters of Key Largo to Islamorada and the lakes of the Kentucky countryside.